Have I just found my new favourite steak joint? I think I have. 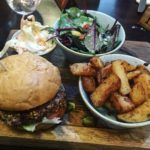 The Bay Horse in Heighington is nestled in a cute little village just beyond Newton Aycliffe and offers a unique and exciting concept when it comes to good steak. The bar and restaurant is a quintessential pub. Cosy, welcoming and warm, it’s a classic village local. Whether you’re in the area or like to travel for good grub, I highly recommend The Bay Horse eatery. So, what makes The Bay Horse’s 28-day aged steak so different? Each individual steak is hand cut to your liking. There is an area of the restaurant in which you can visit and choose the exact cut of meat you’d like, if you wish, and you can then go on to watch your chosen steak being cooked to perfection by Chef. Their “House Steak” options are rump, fillet, sirloin and rib eye. All steak types are priced per 20g, but they also provide an approximate price for your standard 8oz steak, all of which are fairly standard for a good, juicy steak. You don’t have to go for the 8oz though. A 12oz? A 16oz? Whatever you think you can tackle, they’ll cut it just for you. 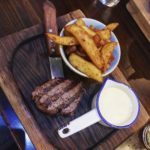 The Bay Horse also have a “Premium Steak” range including the Yorkshire Wagyu Sirloin and the Highland Premier Wagyu Sirloin. 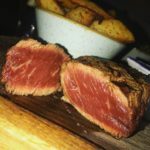 Whilst much more expensive than your usual steak options, they’re described as “extra special” and I would love to try them out, being the carnivore than I am. Before we get to the mains, we’ll give a shout-out to the starters. I chose the Mushroom Pepper Pot, a concoction of button mushrooms in a peppercorn sauce layered with creamy Stilton. It was amazing. The strong yet smooth cheese softened the peppery sauce and made for delightful first impression. 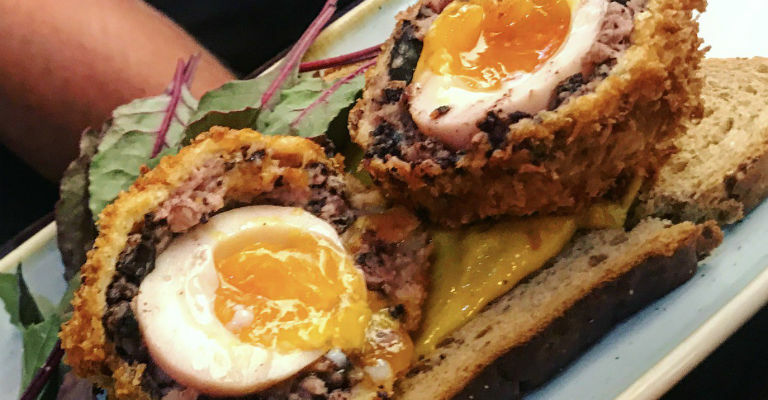 However, the Scotch Egg rivals all starters. Ever. A runny middle, a slightly spicy, meaty coating place on a slice of onion bread and with a slathering of coronation mayonnaise. Personally, I think the unusual addition of the mayonnaise made the dish; the flavours and seasoning work so well to create one incredibly tasty pre-main delight! If you don’t order this little number when you visit The Bay Horse, you’re missing out. So onto the main event… I decided upon the fillet, my favourite cut of steak. It worked out approximately £22.00 for the 8oz. I asked for it rare (is there really any other way?) and it was cooked flawlessly – exactly how rare should be cooked, in my opinion. You could tell in the taste that the meat was of the highest quality and, with the perfect amount of marbling, it just melted in your mouth. Strong statement, I know, but it might just be the best steak I’ve ever had. You can choose between three options when you order a steak main. I opted for choice number two and adorned my steak with the most subtly beautiful blue cheese sauce. The presence of the cheese wasn’t overpowering but the hint was very much there, so instead of being sickly it was simply moreish and perfect for dunking in those thick, homemade chips too. Proper chips. There isn’t just steaks available though, there is quite an extensive menu on top of that. 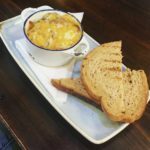 It’s mostly classic, British pub dishes such as fish and chips, hunters chicken, the Teesside parmo and stroganoff, but they also offer a solid selection of Speciality Boards, which is most definitely my next challenge! 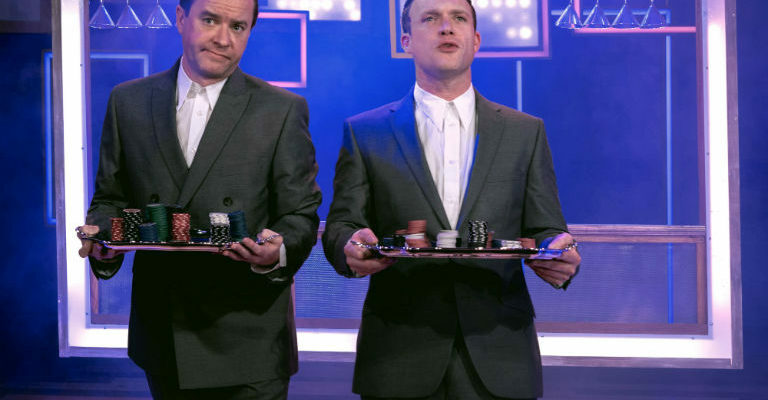 The boards offer a selection of tastes and flavours, such as the “Celebration of Pork” or “The Marrakech Express”, which involve a variety of bites that honour a cuisine or specific type of food. Our table also ordered a couple of the burgers (shock): The El Paso Tex Mex Burger and the Charlestown Burger both arrived, each looking approximately as large as my head. The El Paso number celebrated all things Mexican and covered a thick, meaty patty with bacon, jalapeños, chilli cheese, guacamole and sour cream. It had a lot of kick, but the heat was addictive and could be cooled by the addition of homemade, creamy coleslaw. And those proper chips. 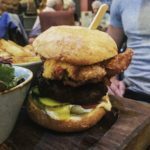 The Charlestown was an absolute beast, with the burger, rashers of bacon, hot shot sauce and… wait for it… a chicken parmo on top. The meat from both burgers, again, was very clearly good quality and both were seasoned beautifully. 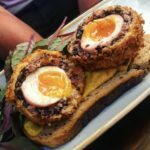 If you like new concepts and bloody good food, the personalised service you get at the Bay Horse will be right up your street. 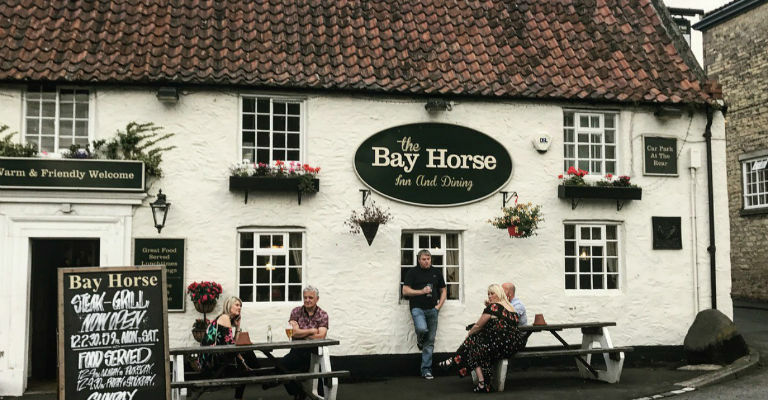 For more information about The Bay Horse in Heighington, visit their website. 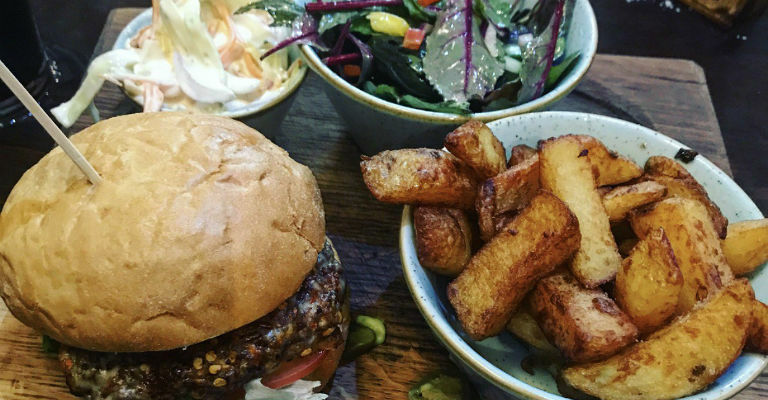 For more of Laura’s food reviews, visit Proper Scrumptious. See more of Laura’s photos from her meal below.